The REV IT UP Reveille Men’s Chorus Annual Fundraiser is on its way! Reveille Men’s Chorus is preparing to spread their angelic wings and deliver their gifts of song all over our incredible little community. They have the new cast set (congrats to all new members) and planning is underway on an awesome season. 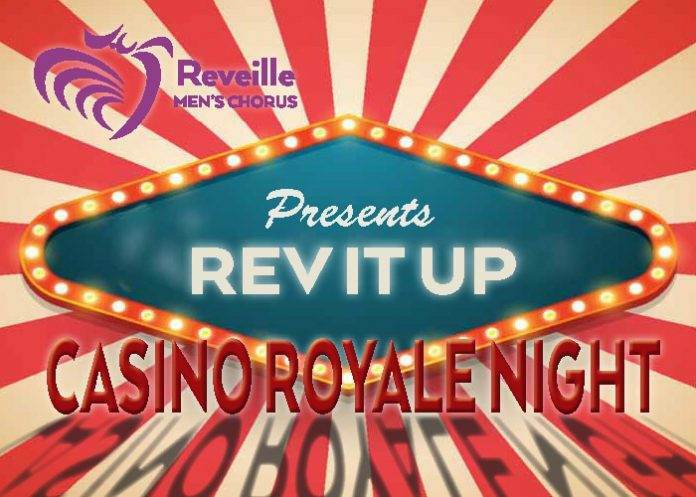 Let’s help make sure this is the best yet by having a blast at Reveille’s annual fundraiser, REV IT UP Casino Royale Night! 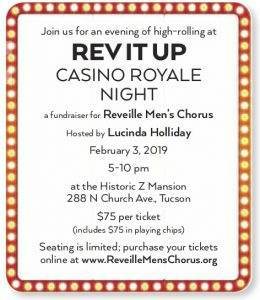 When and Where is REV IT UP Reveille Men’s Chorus Annual Fundraiser? On the evening of Sunday, February 3rd, you owe it to yourself to head Downtown to the Historic Z Mansion on North Church. Seating is limited and tickets are selling fast, so as soon as you finish reading this sentence I want you to click over and reserve your spot, then come right back! What Can I Expect at REV IT UP Reveille Men’s Chorus Annual Fundraiser? 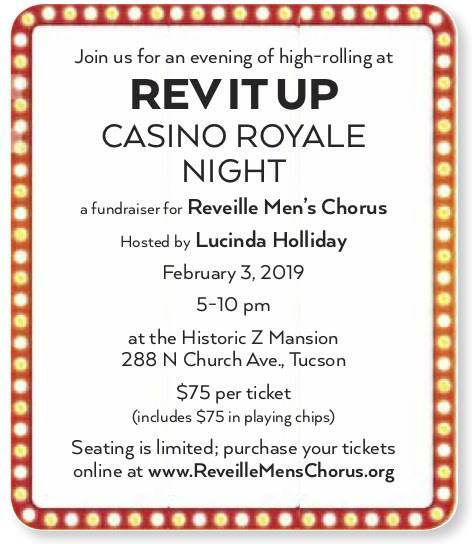 If you’ve never been to a REV IT UP, they are raucous fundraising events that support Reveille Men’s Chorus’ mission of “Changing Lives Through Music”. Just last year, Reveille brought out Leslie Jordan from the hit show, “The Cool Kids” to perform a solo comedy set that had the audience howling. Casino Royale Night will be just as entertaining. You’ll begin the evening with a decadent cocktail hour followed by a delicious buffet dinner. Once the food is away, it’s time to come out and play the high-rolling games and win the awesome awards! 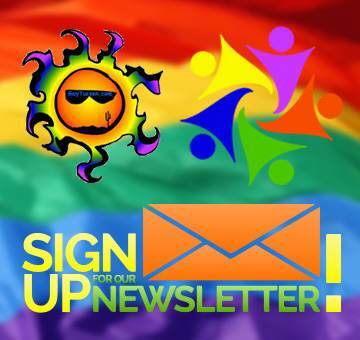 Check out REV IT UP – Casino Royale Night on the GayTucson Calendar for everything else you’ll need to know about this incredible event!